Windsor is the pioneer of EPS (thermocol) processing in Northern India. Our Managing Director Mr.Parvinder Singh Sahni, a first generation entrepreneur, established the parent company, Windsor Packaging Pvt. Ltd. (now known as Windsor Industries Pvt. Ltd.), in 1989 and the other group companies were added and became operational as per the need and growth of the market. Manufacturing of thermocol disposable cups and plates was a logical diversification having manufacturing synergy with the present operations. Windsor Industries Pvt. Ltd, Kurali/Baddi, is one of the largest manufacturers of EPS (thermocol) packaging, its components and disposable products in India. Our key objective is to manufacture and supply quality products along with quantity, which can meet our customer’s expectations in a cost effective manner and provide them with best services. Windsor is one of the most versatile and leading group engaged in diverse manufacturing activities. Windsor is considered synonymous with ultra- precision, specular quality, high-volume quantity and timely delivery backed by dedicated services to our customers. It is the only industrial house in this region having in-house tool room comprising of all the latest equipments to prepare the Moulds from inception till production in three days time. These facilities are located at Kurali and Baddi. In the same location; Windsor is also running a plant to manufacture a variety of BOPP Self Adhesive Tapes in all the sizes. This sophisticated plant has a capacity to coat approx. 400 Tons of BOPP Film per annum. This plant has also been provided with independent multi-color printing machine to manufacture these tapes as per the specific logo and design of the customer. Both the above units have also been provided with independent laboratories to ensure the proper quality of input as well as quality and consistency of the end product. In another location i.e. at Baddi Industrial Area, Windsor has set up one of the largest unit to manufacture EPS disposable glasses in ML sizes (135ml, 150ml, 200ml, 250ml, and 300ml) and EPS. 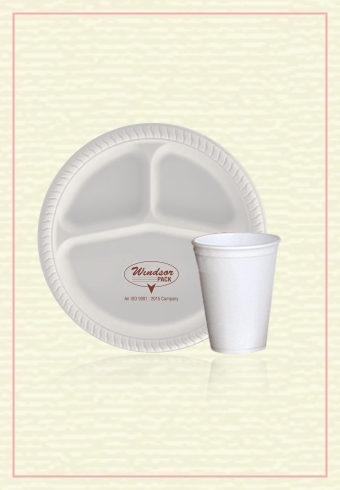 Disposable plates, donas and bowl of various sizes (Plates 3 CP, 4CP Round, 4CP Square,6 CP Plate (Spl. ), 6”, 8”, 10”, 12” and Bowl & Donas), and lunch boxes in different sizes are also manufactured. This unit has the capacity to produce two million glasses per day in various sizes. This ultra-modern unit is running with imported plant and machinery and latest automated technology. Recently, Windsor have introduced an absolutely new concept in the Biodegradable Disposable Crockery for the first time in India. It has embarked in manufacturing disposable crockery by biodegradable corn starch, which apart from being eco-friendly, also redefines the way your partake food. We are ISO 9001: 2008 & 14001:2004 certified for all the product lines.